To be an elite level player at a college or professional sport, you need a degree of exceptional athleticism. And the best medically, scientifically and psychologically recommended way to develop such all around athleticism is ample free play and multiple sport participation as a child. Or Steve Nash, who got his first basketball at age 13 and credits his soccer background for making him a great basketball player, a similar story to the 100 professional athletes interviewed in Ethan Skolnick and Dr. Andrea Korn’s Raising Your Game . Early sport specialization in female adolescents is associated with increased risk of anterior knee pain disorders including PFP, Osgood Schlatter and Sinding Larsen-Johansson compared to multi-sport athletes, and may lead to higher rates of future ACL tears. In January 2015, I had the honor of sitting in a lecture with Manchester United Performance Coach Tony Strudwick, winner of 13 titles as the fitness coach for Manchester United’s first team. 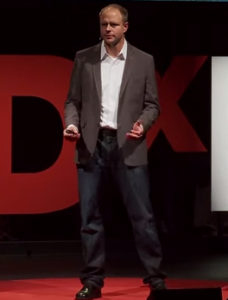 His advice was that a multi-sport background prior to the age of 12 set up soccer players for long-term success by lowering the rates of injuries and making them more adaptable to the demands of elite level play. “More often than not,” he stated in a recent interview with SoccerWire.com, “the best athletes in the world are able to distinguish themselves from the pack thanks to a range of motor skills beyond what is typically expected in a given sport.” He recommended tumbling and gymnastic movements, as well as martial arts, basketball, and lacrosse as great crossover sports for soccer. Better Overall Skills and Ability:Research shows that early participation in multiple sports leads to better overall motor and athletic development, longer playing careers, increased ability to transfer sports skills other sports and increased motivation, ownership of the sports experience, and confidence. Smarter, More Creative Players: Multi-sport participation at the youngest ages yields better decision making and pattern recognition, as well as increased creativity. These are all qualities that coaches of high-level teams look for. 10,000 Hours is not a Rule: In his survey of the scientific literature regarding sport specific practice in The Sports Gene, author David Epstein finds that most elite competitors require far less than 10,000 hours of deliberate practice. Specifically, studies have shown that basketball (4000), field hockey (4000) and wrestling (6000) all require far less than 10,000 hours. No, they are not. They each require specific athletic, technical, and tactical skill sets. 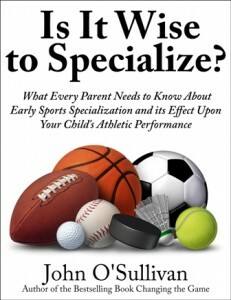 Some sports, in order to be elite, require early specialization, such as gymnastics and figure skating. Other sports are so dependent upon physical prowess (American football, basketball, volleyball, rugby and others) that the technical skills and tactical know how can be developed later. There are many stories of athletes taking up these sports in their teens, even 20’s, and playing at a very high level because of the ability to transfer skills learned in one sport to another. 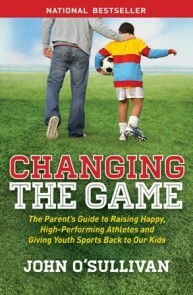 If you want your child to play at a high-level, then the best thing you can do is help them find a sport that best suits their abilities, and help create an environment that gives them the best chance of success. 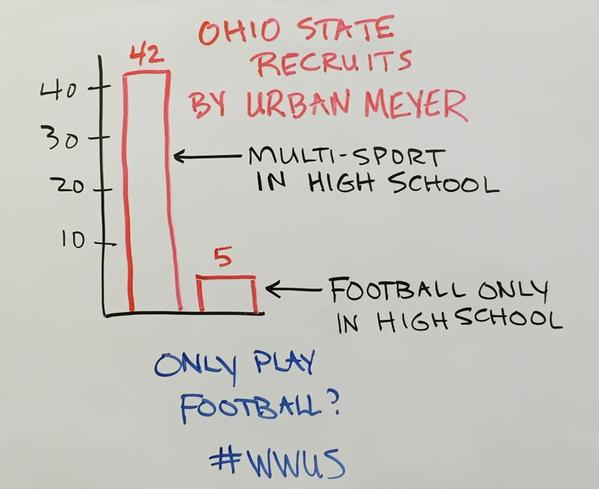 That environment is a multi-sport one. The evidence is in. It is pretty conclusive. Is your bottom line worth more than the well-being of the children you have been entrusted with educating? Thanks to Urban Meyer and the poignant image of his recruiting class breakdown, we now have the opportunity to have this discussion. We have the opportunity to serve our children better. We have the responsibility to help them become better athletes by encouraging them to become all-around athletes. And we can do this by letting them play multiple sports. Butler, Chris: Is Early Sport Specialization a Risk Factor for Anterior Knee Pain in Female Athletes?